There is no such thing as being self-made. Fifteen years ago, I was exactly where some of you are. I was a first-year college student with a tuition balance I couldn’t afford to pay. I reasoned my only option was to take a semester off, save some money and come back the following semester. That semester off turned into a six-year break. During those six years, I went from being a waitress, saving tips for school to being an administrative assistant at a local finance company with no clear plans for returning to college. I’d later experience being laid off from my full-time job a week before Christmas while nine months pregnant with my first child, and eventually found myself surviving on welfare, unemployment benefits and income from a part-time job. Two degrees and seven internships later, I now serve as a Visiting Assistant Professor of Communication for my alma mater. People often ask how I went from being an unemployed, welfare recipient and a college dropout to a professor who runs her own business. My answer is never simple. There were many factors that contributed to my journey from struggle to success but these factors seemed to have the most positive impact. College isn’t for everybody. But it is worth noting that adult learners consistently report higher overall satisfaction with their college experience than other student groups. Perhaps, with age, we find more value in the breadth of opportunities a college education can provide. For me, college represented a task I’d failed to complete. When I re-enrolled, I did so with a newly lit fire beneath my feet: I had a newborn baby to provide for. Returning to college as an older, single mom, I pursued my education with a tenacity that I’d never attained in my youth. The coursework inspired me to pursue leadership roles in campus clubs and later led to my pursuit of various extracurricular activities and opportunities. Various studies show that internships lead to better career outcomes after graduation. I’m living proof of this prediction. By the end of my undergraduate experience, I’d completed a total of seven internships ranging from local news organizations like Philly.com to national government agencies in The White House. Some internships were paid, others were unpaid, but all of them enhanced my education in ways that coursework never could. Internships enabled me to explore various facets of the media industry, from journalism and social media to corporate communication and public relations. Many of my internships led to recommendations for scholarships, new relationships with mentors, and most importantly, jobs. In addition, during my graduate experience, I studied abroad in Prague. It was an opportunity that I know I’d never have pursued on my own and without the urging and support of my cohort members. I cannot understate how hard I worked to achieve my goals. In every course, I aimed for an A grade, taking advantage of extra credit assignments and every opportunity to improve my GPA. At each internship, I went the extra mile, asking for additional responsibilities whenever I’d completed an assigned task. On any team, I made a concerted effort to be an invaluable asset. In the long run, my hard work definitely paid off. Throughout my career, I’ve continued to follow two simple principles: always do more than is required and always leave a good impression. I have a difficult time understanding anyone who claims to be self-made. No matter what we aim to accomplish, I believe we either have a better shot at it because we stand on the shoulders of someone who blazed the path before us, or because we receive tangible help from others along the way. In my case, it was both. There is no denying the fact that it was easier for me to get acclimated to college life because my older sister attended before me. A recent study found that nearly 70 percent of younger siblings enroll in the same type of college as their older sibling; 20 percent enroll in the same school as a sibling. I also had an incredible village made up of parents, grandparents, siblings, and friends who supported my journey by babysitting, paying for books and school supplies, providing transportation, and cheering me on at every event and ceremony along the way. Some say it is easier to give than to receive because to receive, you have to be humble. Standing in a welfare line is humbling, but government assistance was designed to support people who earnestly seek to improve their lives much like I aimed to do some 15 years ago. Somewhere, someone is one babysitter and one payment shy of completing a degree or reaching the next milestone in her career. If you’re in a position to help someone, support them. If you’re in need, don’t be too proud to ask for and accept help. There’s a very thin line between giving up and greatness. This year I celebrated my 35th birthday. There are many things I thought I’d have accomplished at this age. However, as I look back over my journey I can’t help but notice the perfection of God’s timing. Things didn’t always occur when I expected them to but each step (even the ones that appeared to be missteps) ultimately led to a more meaningful outcome. I wrote about this once when I studied the timeline of Maya Angelou’s life. If you can learn anything from my journey, remember to be a bit more forgiving of yourself. Instead of lamenting over what you haven’t accomplished, spend a little more time celebrating the things you have. We all make mistakes and stumble off the path to our dreams. Failure is an inevitable part of any journey. But if you’re going to fail, #failup. I am an experienced strategic communications manager specializing in internal and external communications, branding and public relations. I have developed clear and effective communications materials and content strategies for high-level organizations in media, publishing, government, and education. I hold an M.A. in Strategic Communication from La Salle University where I currently serve as a Visiting Assistant Professor of Communication teaching courses in journalism and public relations. 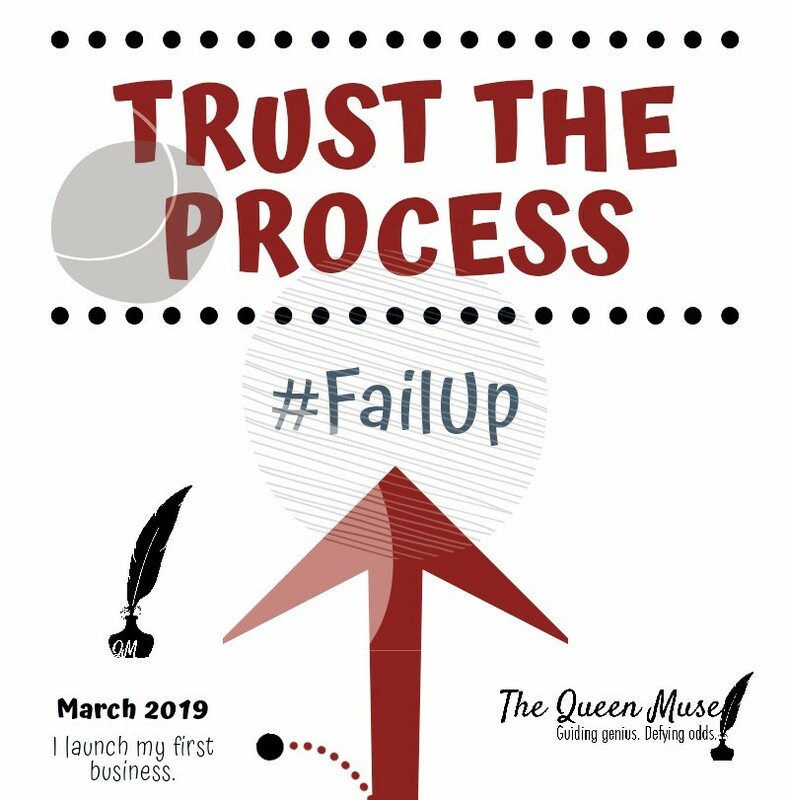 In 2019, I founded The Queen Muse, LLC, to offer writing and public relations services to clients seeking publicity at various stages of building their brands.